Responsibility for collating and publishing indicators transferred to Public Health England on 1 April 2013. The Public Health Outcomes Framework was refreshed in May 2016, following a consultation in 2015. Details of the new framework can be found in the summary technical specifications of public health indicators. Data from the 2012 to 2015 framework, as at May 2016, can be obtained by contacting PHOF.Enquiries@phe.gov.uk if required. The Public Health Outcomes Framework is not a performance management tool for local authorities. PHOF data will enable local authorities to benchmark and compare their own outcomes with other local authorities. You can use and re-use the data and charts from the Public Health Outcomes Framework data tool (not including logos) free of charge in any format or medium under the terms of the Open Government Licence. To view this licence in an offline capacity write to the Information Policy Team, The National Archives, Kew, London TW9 4DU, or e-mail: psi@nationalarchives.gsi.gov.uk. Please state that you obtained the information from the Public Health Outcomes Framework data tool in your published document. Updates to the Public Health Outcomes Framework data tool are published as official statistics. They are produced in accordance with best practice set out in the Code of Practice for Official Statistics to ensure that they are fit for purpose, methodologically sound, politically independent and produced in a transparent way. The phrase ‘Pre-release Access’ refers to the practice whereby Official Statistics in their final form and any written commentary are made available to an eligible person in advance of their publication. The rules and principles which govern pre-release access are featured within the Pre-release Access to Official Statistics Order 2008. Post holders who are given pre-release access 24 hours prior to release can be found in the Public Health Outcomes Framework Collection. We carry out regular user engagement activities to make sure the PHOF continues to meet the changing needs of stakeholders. This report summarises the results and planned actions following the latest 2016 survey of PHOF users and can be found here. Detailed criteria were used to select indicators. These are set out in the table below. - across the health and care system via the other outcome frameworks. They were developed with expert input from stakeholders to provide a comprehensive means of assessing the suitability of each candidate indicator. These were used to assess the final set of indicators, including those suggested in response to the initial consultation. Indicators that passed a sift, based on the criteria, went on to form the first publication of the Public Health Outcomes Framework. When the PHOF was first published in 2012 there was a commitment not to make any changes for three years to allow it to become established during the transfer of public health responsibilities from the NHS to local authorities. In 2015 a consultation on the PHOF indicator set was carried out to make sure that the PHOF is still as relevant and as useful as possible. To maintain the balance of areas covered and promote continuity, it was determined that the consultation would not result in a wholesale overhaul of the existing structure of the PHOF. It would focus on reviewing existing indicators with the aim of removing ineffective indicators and replacing or revising others where improvements in data have taken place over the past few years. It would also provide an opportunity to consider adding a small number of new indicators where there are important public health gaps and information is available to fill them. The government response to the consultation on refreshing the indicators has further detail here. It is planned to update the framework every 3 years so a further process will begin in 2018/19. If you are working on indicators for future inclusion, they will need to meet the criteria by then - please discuss this with us during indicator development by contacting PHOF.Enquiries@phe.gov.uk. It presents changes over time for most indicators, with a clear indication of whether the indicator values are rising or falling, and whether that change is ‘good’ or ‘bad’. It presents indicator values for different areas alongside each other, essentially showing an area in the context of other areas’ values. It presents indicators alongside comparator values, such as national or regional averages, targets or benchmarks, and highlights differences between local values and the selected reference value using red-amber-green (RAG) ratings. PHE has produced a range of technical guidance to aid the interpretation of indicators and comparators. Data are published as part of a quarterly update cycle in August, November, February and May. Exact dates will be announced on the www.gov.uk statistical release calendar and this website. Updates and additions will be announced on the homepage. You can also receive updates by following @phoutcomes on Twitter. The quarterly schedule for updating each PHOF indicator can be found here – however dates are provisional as updates are dependent on when data is available. A list of indicators updated, for the most recent and previous releases, can be found in the Public Health Outcomes Framework Collection within www.gov.uk. Public Health Outcomes Framework data will be revised and corrected in accordance with Public Health England's Official Statistics Revisions and corrections policy and the Code of Practice for Official Statistics. A revisions and corrections document listing all changes to the indicators within the PHOF from September 2017 can be found here. Indicators in the Public Health Outcomes Framework have been based on existing data sources wherever possible. The data source for each indicator is set out in the definitions tab. Indicators are only shown in the tool where there are data available for them. All indicator data that is contained in the webtool is available to download from the download tab and metadata for the data download can be found here. The fingertipsR package allows you to download public health data using R and the Fingertips API (Chrome only) allows public health data to be retrieved in either JSON or CSV formats. The Public Health Outcomes Framework focuses the whole system on achieving positive health outcomes for the population and reducing inequalities in health. The majority of indicators in this framework have the potential to impact on inequalities and we aspire to make it possible for all indicators to be disaggregated by equalities characteristics and by socioeconomic analysis wherever possible in order to support work locally to reduce in-area health inequalities where these persist. A list of inequalities data available within the tool is available here. In July 2017 PHE published a health equity report which presents analysis and commentary on inequalities for 18 indicators from the PHOF. This report supports understanding of inequalities in health for different populations in England, with a particular focus on inequalities between ethnic groups. The report was accompanied by a blogpost on ‘Understanding health inequalities in England’. 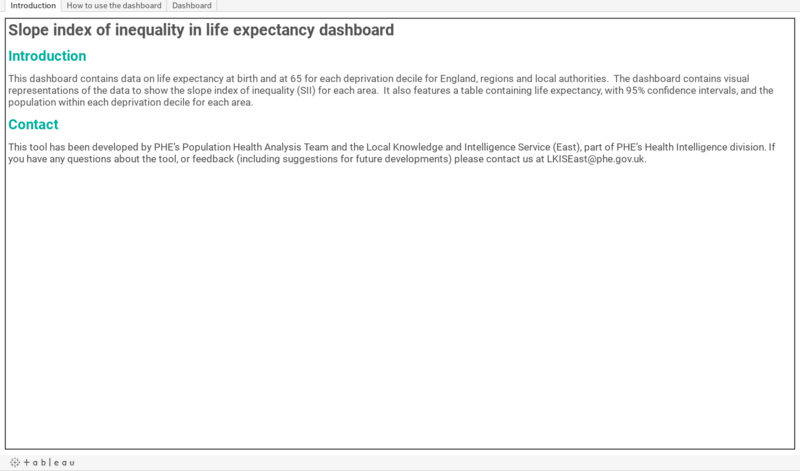 In the data tool, it is possible to compare your local authority with others in the same region, Public Health England Centre or deprivation decile in the Overview tab. It is also possible to compare your local authority with its CIPFA nearest neighbours (for details of these, see here). For Lower Tier Local Authorities, the ability to compare to others within the same ONS classification group is also available. Combined Authority groupings have now been added to the tool. Other comparators may be added in future. Please let us know if you have any specific requirements. In July 2015, Public Health England reorganised its Centres (the parts of the organisation that provide local advice and support to the public health system), moving from 15 Centres to 9. The new Centre areas are largely co-terminous with the former Government Office Regions; the only difference is Milton Keynes local authority being located in the East of England PHE centre (whereas it is located in the former South East Government Office Region). Values for City of London and Isles of Scilly local authorities are not included when calculating the highest and lowest values for England that are used in the spine charts in the Area Profiles view. The reason for this is that for many indicators, these values can artificially skew the distribution of values in England. They are therefore excluded to give a more representative range of values. The England best and worst values are not displayed (and the spine chart is absent) in the Area Profiles view if more than 25% of local indicator values are not presented. For many indicators, the way that the colour is assigned is based on statistically significant differences from the England value. This is determined within the PHOF tool by using the England or region value depending on the benchmark selected and seeing whether this lies within the confidence interval of the Local Authority in question. For some indicators, there is a set goal (for example, 90% for many of the immunisation indicators). If a local authority meets this goal or not determines their colour. Indicators that are shaded blue rather than Red/Amber/Green are presented in this way because it is not straightforward to determine for these indicators whether a high value is good or bad. Indicators that are shaded white are presented in this way because they do not have confidence intervals with which to compare against the benchmark value, and therefore it is not possible to determine whether the local value is statistically significantly higher or lower than the benchmark. the indicator must be a proportion or a crude rate. Only the indicators which meet those three criteria have a “recent trend” marker showing. Markers of significant trends were first added in August 2016, for selected indicator types. In October 2016, we amended the method for the trend icon calculation, by adjusting the significance level from 95% significance to 99.8% significance, as this was felt to be a more appropriate level to test for trends. This functionality is in development, if you would like to feed back any comments, please send them to phof.enquiries@phe.gov.uk. * Armitage P, Berry G. Statistical Methods in Medical Research (3rd edition). Oxford: Blackwell 1994. The boxplot is a standardised way of displaying the distribution of data. In the Fingertips suite of profiles we have displayed the 95th percentile, 75th percentile, median, 25th percentile, and 5th percentile in chart format, as well as the minimum and maximum values in table format, for each indicator. The boxplots can be viewed based on the distribution of data for all Counties & UAs, Districts & UAs, or Regions within England by selecting the Area Type. They can be filtered to show only the lower geographies within a Region by selecting the Region benchmark. This will show you the distribution of the values for the selected indicator regionally. Documents showing all indicators for a particular area can be found in the Download section. It is advised to reduce the scaling percentage from Print Preview to fit more content onto each page. If you have any feedback or enquiries on these documents, please send an email to PHOF.Enquiries@phe.gov.uk. Also available is a technical user guide for the overarching indicators and a link to the ONS data and briefing for 0.2vi (local level healthy life expectancy slope index of inequality). The PHE Obesity Risk Factors Intelligence team have produced supporting indicators for the excess weight in adults (aged 18 and over) data in the PHOF. Breakdowns of local authority prevalence data by BMI category are presented in an Excel spreadsheet: underweight, healthy weight, overweight, obese, severe obesity and excess weight. The spreadsheets at the following link provide trend data on the prevalence of excess weight (overweight including obesity) in children from 2010/11 to 2016/17 and obesity from 2008/09 to 2016/17. Data from the National Child Measurement Programme (NCMP) is presented for 2011 Middle Super Output Areas (MSOA), 2015 Electoral Wards, 2015 Clinical Commissioning Groups (CCG), 2013 local authorities, and England: Child obesity and excess weight data at small area level. This page provides links to all PHE data and analysis tools, including specific tools around child and maternal health, alcohol, tobacco, sexual and reproductive health, child obesity and end of life care. The purpose of the dashboard is to support local decision-making by bringing existing comparative data into one place and making it accessible and meaningful to a wide audience. The Local Authority Health Profiles provide an overview of health for each local authority in England. They pull together existing information in one place and contain data on a range of indicators for local populations, highlighting issues that can affect health in each locality. Local Health provides quality assured health information at small area level. Fair Society, Healthy Lives: The Marmot Review report was published in February 2010, presenting the recommendations of the Strategic Review of Health Inequalities in England post-2010. The Marmot Indicators for local authorities were released, providing information to support monitoring of the overall strategic direction in reducing health inequalities. A summary of NICE guidance on nursing and midwifery, to underpin practice that will improve population health and wellbeing. The Lesbian, Gay, Bisexual and Trans Public Health Outcomes Framework Companion Document is a resource for all those commissioning and delivering healthcare services in order to support the delivery of an equitable public health system. The full document can be found here.